My brother is an awesome cook, the kind of cook I wish I was. He is able to just throw ingredients together and have a dish turn out delicious. Maybe it has to do with the fact that all through high school and college he worked in the restaurant industry. I can’t cook like that, or I choose not to. As I’ve said before, I didn’t grow up cooking — I started cooking when I got married. I like having a book and specific instructions. Yes, I always change up recipes or write my own, but I am meticulous about writing down every ingredient and the amount used. If something turns out great, I want to know exactly what was put into the dish. 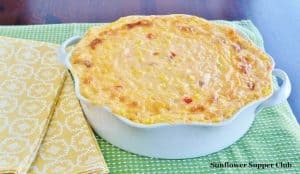 The last time my brother’s family was at our house for a visit, he whipped up a Creamy Corn Bake similar to this recipe, which is similar to a dish served at a BBQ restaurant in Kansas City. I watched him throw everything together, and of course, I took some notes on what he did. What I’m sharing with you today is my version of the corn dish that he made for us. I can’t wait for summer to try this with fresh corn. My family inhaled it, which in my book is the sign of a great recipe. In a large sauce pan over medium heat, cook the bacon until crisp. Leave about 1 tablespoon bacon grease in pan and add butter. Add the onion and red pepper and sauté about 5 minutes over medium heat until vegetables soften. Add garlic and sauté 1 minute until fragrant. Add flour and whisk 1-2 minutes until bubbly. Add the milk and bring to a simmer. Simmer a few minutes until mixture thickens slightly. Remove from heat and add the cream cheese and the shredded cheese, stir until melted. Add the Frank’s, corn, salt, pepper and sour cream and cooked bacon.